The Scrypt cloud mining service Scryptcc was one of the first to start offering Scrypt cloud hashrate using GPUs for mining alternative Scrypt-based crypto currencies and paying its users in Bitcoin. The service was quite interesting when they’ve launched, but had some issues from the start and they were a bit slow in fixing things, but lately they seem to have improved. In fact we’ve seen some similar services come and go and this one is still here and without having some major hiccups like others had. The interesting thing was that up until recently they were still using only GPUs for mining Scrypt and thus the profitability was not good at all. However there is a new announcement that they have started adding Scrypt ASICs in their new data center and report that profitability has started to get better again. Currently the price of 1 KHS is ~0.000324 BTC or about 0.324 BTC per Megahash worth of Scrypt mining hashrate at the service, so definitely not the best price. According to the profit calculator available on their website buying 1 MHS of cloud mining hashrate at the moment you can expect to break even in about 152 days. This is not the best deal we’ve seen for sure, but not the worst either. 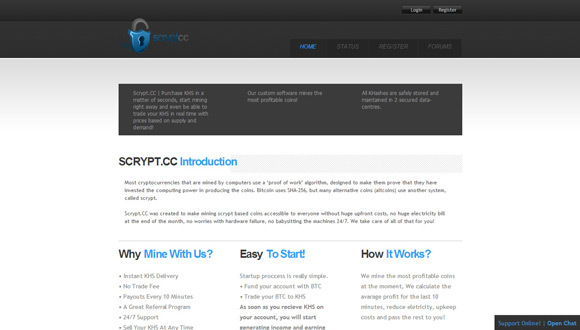 After using the scryptcc cloud mining service for a over two weeks already we are ready to draw our final conclusions about it. Initially the service seemed very promising with a few things that needed to be fixed and some extra polishing of the already available features, so we had high hopes and have invested into it until going up to 400 KHS worth of Scrypt mining power. We were buying from the second batch of 100 MHS (total of 200 MHS or 200000 KHS) were sold by the service provided to users and we have also reinvested our earnings into more kilohashes. And as expected when the second 100 MHS batch was sold out the price per KHS started to increase as you had to buy from other users that are selling their already purchased hasrate. As predicted this meant that if you went early and bought from the “cheaper” KHS you could also profit by selling them later at a higher price, along with the earnings you will get by them mining for you. Selling the 400 KHS hashrate that we’ve had purchased in the service along with the profit from mining for this time, we ended up making about 0.05 BTC profit which is not bad. However we wanted to invest into more Scrypt hashing power as well as to continue using the service for longer periods of time. With this level of support, or the lack of such, we have decided to get out of the service with small profit and not risk having a more serious issue that will have to wait for who know how long to be resolved and that could lead to loosing money or coins. Our final advice is to stay away from the scryptcc cloud mining service and if you have already purchased some KHS there you might want to sell them and reinvest the coins into another more reliable and better service. We have done that and are already trying another alternative services and may revise our conclusion in a few weeks of time if there is some improvement. The second batch of 100 MHS that was released for sale at the Scryptcc cloud mining service by the service providers has been completely sold. This means that currently all of the trades of KHS going on at the exchange are between users that have purchased hashrate and as a result the exchange rate has started to go up. The initial price per KHS was 0.00144444 BTC and now the cheapest price you can purchase has gone up to 0.00144998 BTC per KHS and will probably continue to increase if the demand goes up. The Scryptcc hashrate provided by the service is total of 200 MHS of Scrypt mining power out of which we have purchased some extra KHS going from the 239 KHS that we’ve already had to 404 KHS as a part of our testing of the cloud mining service. With the current exchange rate per KHS at Scryptcc going up means that if you purchase hashrate now the break even in time will be longer than if you have purchased a few days ago. The return of investment time of course also depends on the current profitability of the alternative crypto currency being mined by the service and the Income Calculator reports 174 days at the moment. Today we also got a message from the support that they are working on some of the problems we have reported, so hopefully in the next few days they will be finally able to resolve the issues that are more of an annoyance than something serious, but still need to be fixed. We’ll keep you updated on the progress of our testing as for now we are going to keep reinvesting what we earn from the 404 KHS that we currently have purchased. If the price per KHS continues to get higher we may also decide to sell some hashrate as so far we have only been purchasing KHS, as this is a good way to make some extra and quick profit, unless of course the service providers decide to add another batch of 100 MHS for sale.